McGrath has been called "the Michael Jordan of Supercross" by the "Los Angeles Times," and in this revealing book, the fans not only get his personal story, but also a detailed guide running throughout on how everyone can become a Supercross racer. 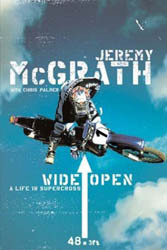 The Wide Open A Life in Supercross (Paperback) has not been rated. Be the first to rate the Wide Open A Life in Supercross (Paperback). Earn rewards by rating products.